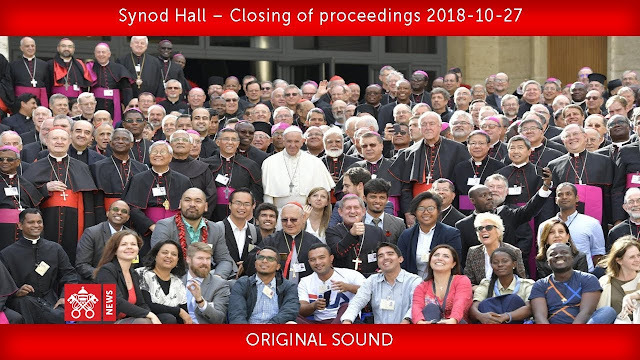 On Saturday afternoon, the Final Document of the XV Ordinary General Assembly of the Synod of Bishops consisting of 3 parts, 12 chapters, 167 paragraphs and 60 pages is approved in the Synod Hall. The text was received with applause, Cardinal da Rocha said. It is “the result of real teamwork” on the part of the Synod Fathers, together with other Synod participants and “the young people in a particular way”. The Document, therefore, gathers the 364 modifications, or amendments, that were presented. “Most of them,” the Cardinal said, “were precise and constructive”. Furthermore, the entire document passed with the necessary 2/3 majority voting in favor. “Walking together” is the synodal dynamic which the Fathers also bring to light in the part three. They invite the Conferences of Bishops’ around the world to continue the process of discernment with the aim of developing specific pastoral solutions. The definition of “synodality” provided is a style for mission that encourages us to move from "I" to "we" and to consider the multiplicity of faces, sensitivities, origins and cultures. One request repeatedly made in the hall, was that of establishing a "Directory of youth ministry in a vocational key" on the national level, that can help diocesan and parish leaders qualify their training and action "with" and "for" young people, helping to overcome a certain fragmentation of the pastoral care of the Church. The Synod Document reminds families and Christian communities of the importance of accompanying young people to discover the gift of their sexuality. The bishops recognize the Church's difficulty in transmitting "the beauty of the Christian vision of sexuality" in the current cultural context. It is urgent, the document says, to seek "more appropriate ways which are translated concretely into the development of renewed formative paths".